A lukewarm response to these series of ambitious works induced Fragonard to abandon Rococo and to experiment with Neoclassicism. He married Marie-Anne Gérard, herself a painter of miniatures, (1745–1823) on 17 June 1769 and had a daughter, Rosalie Fragonard (1769–1788), who became one of his favourite models. In October 1773, he again went to Italy with Pierre-Jacques Onézyme Bergeret de Grancourt and his son, Pierre-Jacques Bergeret de Grancourt. In September 1774, he returned through Vienna, Prague, Dresden, Frankfurt and Strasbourg. Back in Paris Marguerite Gérard, his wife's 14-year-old sister, became his pupil and assistant in 1778. In 1780, he had a son, Alexandre-Évariste Fragonard (1780–1850), who eventually became a talented painter and sculptor. The French Revolution deprived Fragonard of his private patrons: they were either guillotined or exiled. The neglected painter deemed it prudent to leave Paris in 1790 and found shelter in the house of his cousin Alexandre Maubert at Grasse, which he decorated with the series of decorative panels known as the Les progrès de l'amour dans le cœur d'une jeune fille, originally painted for Château du Barry. The Swing (French: L'escarpolette), 1767, Wallace Collection, London. For half a century or more he was so completely ignored that Wilhelm Lübke's 1873 art history volume omits the very mention of his name. Subsequent reevaluation has confirmed his position among the all-time masters of French painting. The influence of Fragonard's handling of local colour and expressive, confident brushstroke on the Impressionists (particularly his grand niece, Berthe Morisot, and Renoir) cannot be overestimated. Fragonard's paintings, alongside those of François Boucher, seem to sum up an era. 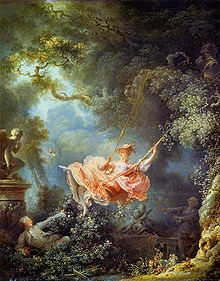 One of Fragonard's most renowned paintings is The Swing, also known as The Happy Accidents of the Swing (its original title), an oil painting in the Wallace Collection in London. It is considered to be one of the masterpieces of the rococo era, and is Fragonard's best known work. 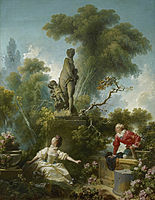 The painting portrays a young gentleman concealed in the bushes, observing a lady on swing being pushed by her spouse, who is standing in the background, hidden in the shadows, as he is unaware of the affair. As the lady swings forward, the young man gets a glimpse under her dress. According to Charles Collé's memoirs a young nobleman had requested this portrait of his mistress seated on a swing. He asked first Gabriel François Doyen to make this painting of him and his mistress. Not comfortable with this frivolous work, Doyen refused and passed on the commission to Fragonard. 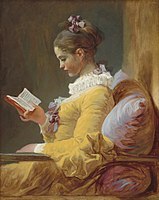 A Young Girl Reading, c. 1776, National Gallery of Art, Washington, DC. 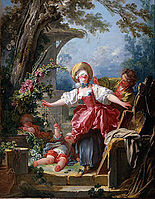 Consuming Passion : Fragonard's Allegories of Love – Sterling and Francine Clark Art Institute, Williamstown, MA, from 28 October 2007 to 21 January 2008. Fragonard. Origines et influences. De Rembrandt au XXIe siècle – Caixa Forum, Barcelona, from 10 November 2006 to 11 February 2007. Jean-Honoré Fragonard, dessins du Louvre, Musée du Louvre, Paris, from 3 December 2003 to 8 March 2004. Fragonard’s Enterprise: The Artist and the Literature of Travel – Norton Simon Museum, Pasadena, from 17 September 2015 to 4 January 2016. ^ a b Houël de Chaulieu, Philippe (May 2006). "L'histoire en marche; Anniversaire: Jean-Honoré Fragonard". Intermédiaire des chercheurs et curieux. No. 644. pp. 571–574. ISSN 0994-4532. Retrieved May 9, 2009. ^ Donald Posner (August 1972). "The True Path of Fragonard's 'Progress of Love'" (PDF). Burlington Magazine. Archived from the original (PDF) on 10 January 2014. Retrieved 21 February 2013. ^ "The Project Gutenberg eBook of Encyclopædia Britannica, Volume X Slice VII – Fox, George to France". ^ "Fragonard, Jean-Honoré", WebMuseum, Paris. Retrieved 22 June 2014. ^ a b Collé, Charles. Journal et mémoires de Charles Collé sur les hommes de lettres, les ouvrages dramatiques et les événements les plus mémorables du règne de Louis XV (1748–1772). III. Paris: Firmin Didot Frères, Fils et Cie. pp. 165–166. ^ Although his identity was not unveiled by Collé, it has been thought that it was Marie-François-David Bollioud de Saint-Julien, baron of Argental (1713–1788), best known as Baron de Saint-Julien, the then Receiver General of the French Clergy. However there is little evidence for this, according to Ingamells, 163–164. ^ "Fragonard Portrait on View at Bonhams Geneva Prior to Benefit Sale". artfixdaily.com/. 8 August 2013. Retrieved 11 August 2013. This article incorporates text from a publication now in the public domain: Chisholm, Hugh, ed. (1911). 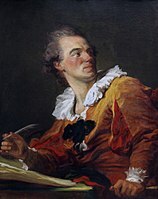 "Fragonard, Jean-Honoré" . Encyclopædia Britannica. 10 (11th ed.). Cambridge University Press. pp. 772–773. Edmond and Jules de Goncourt (1881–1882). "Fragonard". 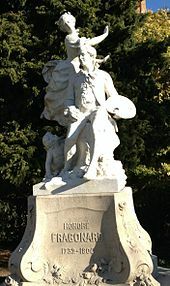 L'Art du XVIIIe siècle. III. G. Charpentier. p. 241. ISBN 978-2-35548-008-9. Archived from the original on 2008-11-19. Retrieved 2009-05-10. Dore Ashton (1988). Fragonard in the Universe of Painting. Smithsonian Institution Press. ISBN 0-87474-208-0. Mary Sheriff (1990). Fragonard: Art and Eroticism. The University of Chicago Press. ISBN 0-226-75273-9. Georges Wildenstein (1960). 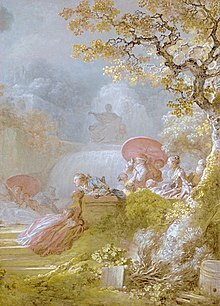 The Paintings of Fragonard. Phaidon.